Once again the stage is set for the Gloucestershire Warwickshire Steam Railway’s spectacular Cotswold Festival of Steam with an expected eight locomotives* in steam over the late May bank holiday weekend. The theme this year is ‘Give My Regards to Broadway‘ and it will celebrate the re-opening of Broadway Station, which now gives us 15 miles of running line from Cheltenham Race Course Station all the way to Broadway. ‘Give My Regards to Broadway’ – what’s that all about? The big attraction of the Cotswold Festival of Steam must be the locomotives – and there will plenty of all shapes and sizes, however this year will be the first opportunity to travel as far north as the beautifully re-created Broadway station. 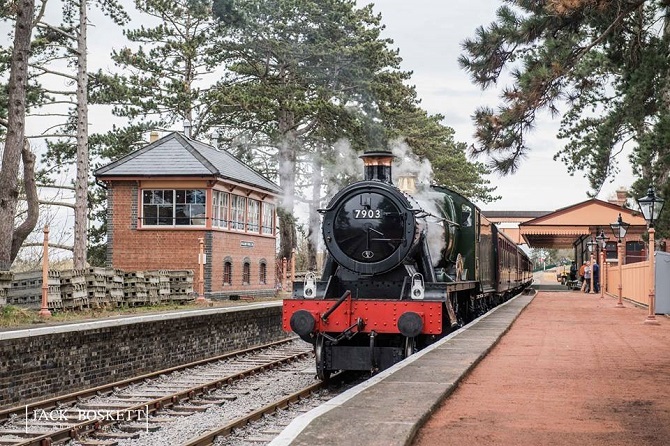 The event team always strive to find locomotives that have never visited the railway before and you may be sure of some surprises at work in the Cotswolds for this breathtaking family-friendly event. The railway’s home fleet of five locomotives will be bolstered by an expected three visitors making EIGHT LOCOMOTIVES operating, adding extra interest and variety. LATEST NEWS: THE KING IS COMING! Star performer will be a GWR ‘King’ on the line for the first time in preservation in the shape of No 6023, King Edward II from the Didcot Railway Centre, plus two further guest engines that will be announced nearer the time. It’s believed that the only occasion a King has ever run over this route before was a ‘positioning move’ for No. 6000 King Geoirge V in the mid-1970s. Broadway station will be re-opened to the public on Good Friday (March 30th 2018). The station building has been built from scratch by our volunteers to an incredibly high standard, from the faithfully recreated English bond brickwork of the building to the authentically rivetted canopy, built “in house” by members of the steam locomotive department. Platform 2 will not be open in time for the gala and the exquisite signal box will unfortunately have to be admired from platform 1. Although the ticket office will be open, the car park won’t be available until after the gala, so please park at either Toddington, or preferably Cheltenham race Course and visit this gem in the Cotswolds on one of our trains. Suffice to say, this will once again be a show to remember.